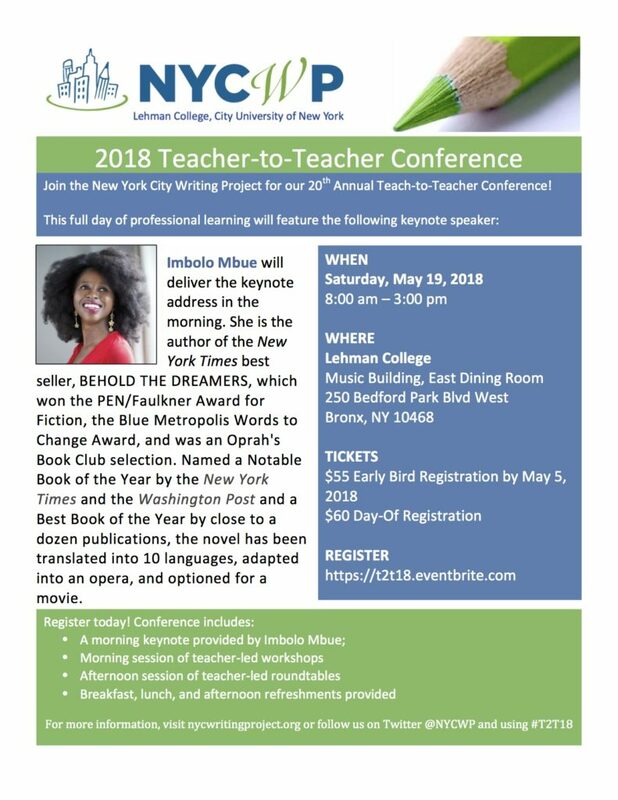 New York City Writing Project – Register for the 2018 Teacher-to-Teacher Conference! Registration for the 2018 Teacher-to-Teacher Conference is open! This year marks the 20th anniversary of the NYCWP Teacher-to-Teacher Conference. Like every year, the conference will feature dozens of workshops and roundtable sessions facilitated by New York City teachers. In these sessions, participants have the opportunity to learn from fellow NYC teachers and walk away with lesson plans, teaching strategies, and a connection to the greater teacher community in New York City. Early Bird Registration ends on May 5, 2018. Don’t wait to register! next → 2018 Summer Open Institutes - Registration Now Open!